Zetha Media – the biggest Polish publisher on British market, has just launched a long-term cooperation with mobile marketing agency – Snapp. The agency will create a long-term plan for promotion and marketing of Zetha Media’s mobile products and channels. Polish team of Snapp specialists will provide support in the area of mobile products’ promotion and marketing actions targeting Zetha Media’s clients in the UK. „Partnership with Snapp is a key factor of our further development on mobile services’ market. 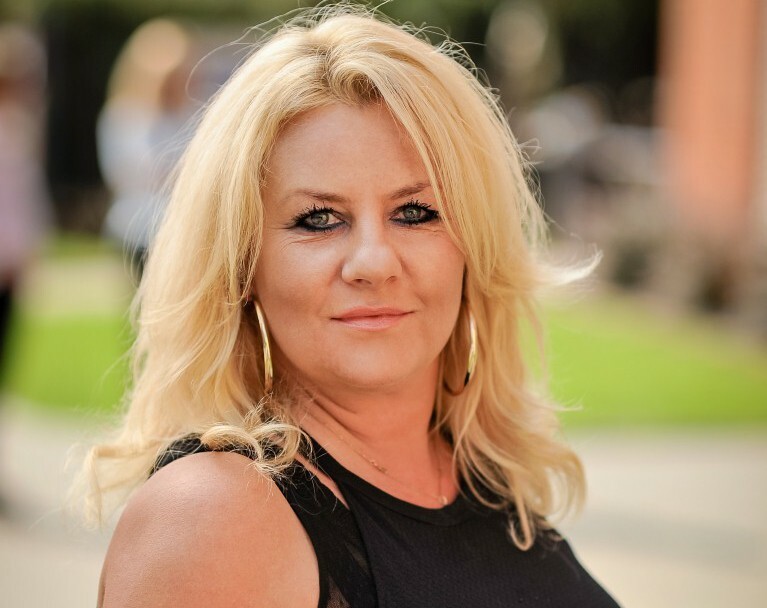 British market is difficult for investors, however, we truly believe that we are now being supported by the best advisers” – said Agnieszka Moryc, Zetha Media CEO. Currently, Zetha Media’s main mobile product is Polish Express News – an application for the Poles living in the United Kingdom. Cooperation with Zetha media opens new doors for us. We are happy to announce that for the first time we are going to operate on British market. We will examine all Zetha Media’s applications, and check how mobile marketing in the UK looks like in practice – said Michał Giera, Snapps’ co-funder and CEO. The contract was concluded for an indefinite period. 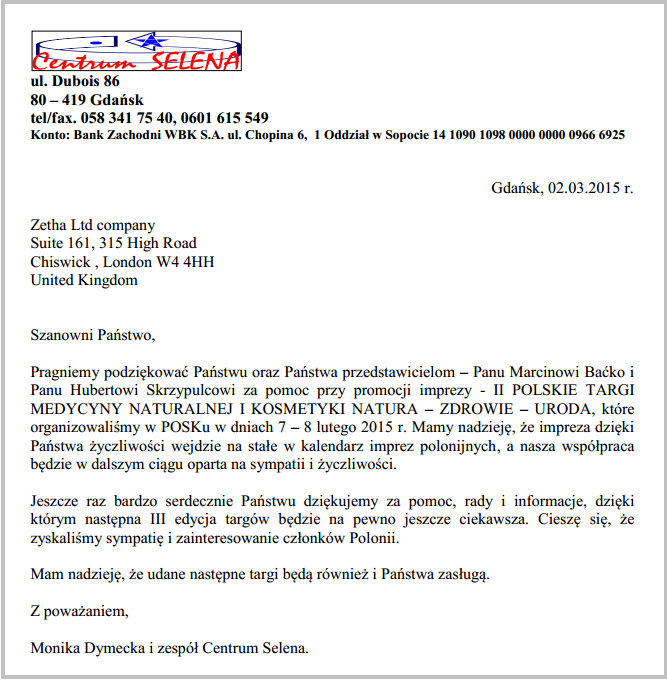 It was OUR pleasure to work with you, Centrum Selena! Such wonderful feeling to receive a thank you letter from our advertiser! PANORAMA Magazine’s Editor-in-Chief about her success – an interview for SUKCES JEST KOBIETĄ web portal. Polish press about ZETHA MEDIA! An interview with Agnieszka Moryc – Managing Director of Zetha. Enjoy reading! Check out the new PANORAMA promo clip! POLISH CHOICE is an unique opportunity for Polish consumers from the United Kingdom to choose the brands they like, appreciate and consider consumer-friendly. For the first time, entrepreneurs, contractors and producers who target Poles living in the UK with their services and products will receive the token of their clients’ gratitude. First edition of POLISH CHOICE OF THE YEAR 2015 concerns the services and products available on the British market that in the bygone year 2014 earned an honorable right to bear the POLISH CHOICE title. Registration process started on February 1st, and the entries from the companies, as well as from the clients, who wish to nominate their favorite company, brand or the entrepreneur present on the British market. Afterwards, from all of the entries, the nominees in the 16 categories will be chosen and the voting will begin. Internet users will be able to cast their votes between 1st and 31st March. Those who will decide to choose their favorite brand will have an opportunity to win valuable prizes, funded by the sponsors and competing firms. In 2015, there are 11 base and 5 additional categories. Also, the title of SUPER POLISH CHOICE OF THE YEAR will be awarded to the brand which will gain the biggest number of votes among all the categories. „Polish companies, Polish workers, our products and services are highly valued not only among Poles living in the UK, but also British people and representatives other nations who buy or use Polish products and services on daily basis. We cannot let the Polish value and the work ethic, for which we are known for, to remain unnoticed. On the other hand, some of the British companies started to appreciate Polish consumers and target them with their products and services. We quickly realized that both of these trends require wider consideration by media, and by the clients who rarely have an opportunity to express how much they like their favorite brand. This is why we came up with the idea for the award. We hope that POLISH CHOICE OF THE YEAR will become an important position on entrepreneurs’ agenda of annual events. I am certain that the POLISH CHOICE statuette and the certificate will become a recognizable and valuable quality mark, not only in the UK but also Poland, Europe and around the world” – says Zetha Media CEO,Tomasz Kmiecik. The event is organized by Zetha Media. 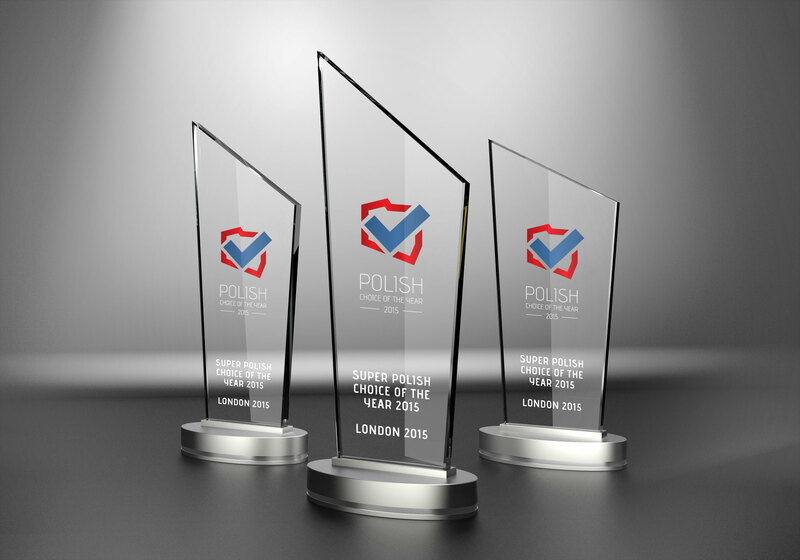 The winners of POLISH CHOICE OF THE YEAR awards will be given statuettes and certificates as a proof of their distinguished position on the products list endorsed by the Polish brands community in the UK. The winners are going to be chosen in April 2015. Honorary patronage over the event was taken by: British Polish Chamber of Commerce and PBLink. Among the media patrons are: Polish Express magazine, polishexpress.co.uk, Panorama magazine,panorama24.co.uk, strefa.co.uk and polacy.co.uk. Te voting will be supervised by Lexito Legal Office. 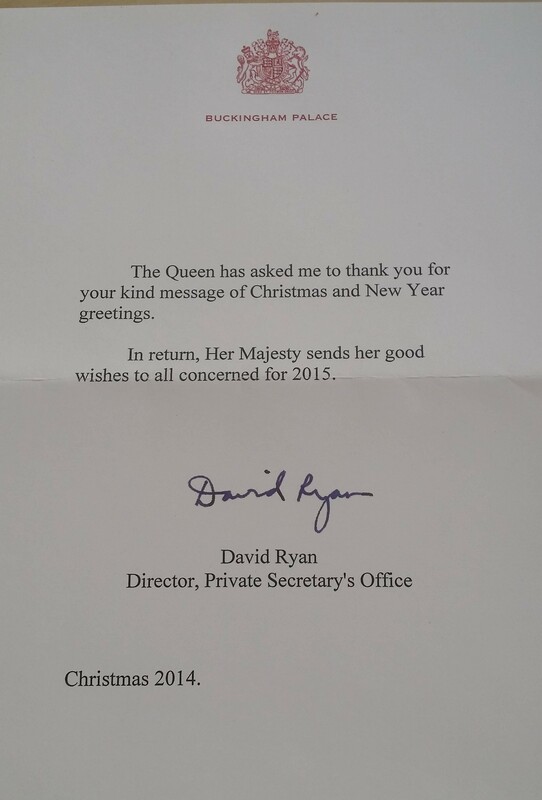 Her Majesty has surprised us with a short letter. We are amused! In January, PANORAMA – a Polish magazine that have been published on British market since 2007, launched a new lifestyle website – Panorama24.co.uk. New Panorama’s website features extended versions of the articles published in the paper version, and aims at being highly interactive. The first version of the magazine’s website was created in 2009, however it have not undergone any changes until this year. The main focus of the newly rebuilt website is to present more content and to engage the users. At the same time, Panorama readers still will be able to access magazine’s back e-issues via the website. At one moment we thought that each week there is much valuable content that we could easily fill twice as many pages than we do now. The internet was an obvious solution for this problem. New Panorama24.co.uk will feature all the extra materials that could not be fitted into the printed version, but could still be extremely interesting and worth sharing with our readers – says PANORAMA’s editor-in-chief – Anna Marszałek. One thing that instantly draws attention to the website is its visual side – each article is illustrated with a number of photos, with video materials to come soon. Further editorial plans are connected with launching collaboration with bloggers. Zetha Media – the biggest Polish media publisher in the United Kingdom started year 2015 with the change of the visual appearance. Media Group had its logo and corporate website freshen up. „We are in the state of constant development. Currently, we are putting the emphasis on new web and mobile technologies. Our old look was not in sync with the dynamics of this development. The new logo and website is a New Year’s present for our partners and contractors. We want to go out there and show everybody who we are and what we do” – says Zetha Media’s managing director Agnieszka Moryc. Unlike when the brand was created, during the re-branding Zetha Media decided to go with Polish specialists. The author of the freshen up logo is Łukasz Szynczewski, and the website was created by Time Studio interactive agency. „We could not be happier with the cooperation with Polish creators. We are want to show our British clients that Poles are extremely talented in many fields” – adds Agniszka Moryc.